Custom versions of seeder rollers for a Jang seeder. So far, the YX-24 and LJ-24 are adapted to become YX-48 and LJ-48 rollers to double the amount of seeds that are planted per revolution of the seeder wheel. Instead of alternating seeds one at a time on each side of the wheel, our wheel drops two seeds at a time. We also made the holes slightly deeper on the LJ-48. May 1, 2015 - Added the YX-80 for arugula seeds. 80 per revolution. 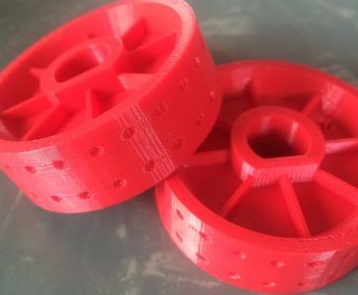 Please let me know what you think and if you actually print and use the seeder wheels. We used the YX-48 to increase the density of our arugula planting and the LJ-48 for our beet seeds.